Acoustic guitars come in a variety of shapes and tonewood configurations. With sizes ranging from petite parlor sized guitars to dreadnoughts and jumbos and with wood choices including maple, rosewood, spruce, cedar, mahogany, and a host of more exotic woods, the best acoustic guitar strings for particular player or guitar can depend on a lot of factors, and the debate can become contentious among loyal players. While the warmer sound of electric flat wound strings are preferred by jazz guitarists, and certain bluegrass players such as Tony Rice prefer nickel wound strings for their softer, warmer tone, the best acoustic guitar strings for most players are almost universally round wound with some version of bronze alloy on a steel core. Beyond this, the best sounding acoustic guitar strings for a particular model is a combination of subjective taste, playing style, and of course, the type of guitar in question. At one time the universal standard for acoustic guitar strings, 80/20 strings (the name references the brass alloy ratio of copper to zinc) are one of the brightest acoustic guitar strings available today. 80/20 Strings, like our Bright Brass™ Acoustic Strings, are very popular on dreadnought and jumbo body guitars, where their extra brightness can help to tame some of the boominess that comes with their larger lower bouts. 80/20 strings are also good for livening up darker sounding acoustics, like some Norlin era Gibsons, or guitars made with laminates, which might tend to sound dead due to their restricted resonance. They can also help resonator guitars cut through better tonally when played with finger picks and deliver a bit more presence when fingerpicking with bare fingers. If you prefer a warmer, fuller tone out of your acoustic guitar, then phosphor bronze strings are typically going to be the best option for you. Phosphor Bronze acoustic strings deliver a comparatively even response from bass to treble strings, while also lasting longer than 80/20 strings (since the phosphorous in the alloy is corrosion-inhibiting). While guitars of all sizes often sound true to their design with phosphor bronze strings, players who prefer OM and Grand Auditorium sized guitars often prefer them for their tendency to get a rich low-end warmth, without sacrificing crispness in the higher registers. Here at Stringjoy, we utilize a particular blend of phosphor bronze called Natural Bronze™, which we choose for its balanced, woody, and even tonal response. We find this to be an excellent choice for players who don’t want a “hyped” tone with accentuated treble and bass, but want a tone that shows off the natural characteristics of their guitar. While the first coated strings utilized a polymer comparable to dental floss (I kid you not!) coated strings are now offered from a variety of manufacturers. The coating (similar to Teflon) is usually woven or fused into the bronze outer wrap to resist the oils and dirt from players’ hands. The tone of coated strings has been a topic of much debate and the number of players who swear by them have grown, though are still in the minority. Fresh out of the package, their tone is slightly deader than those of standard phosphor bronze strings, but to their credit, they maintain that tone throughout their playable lifetime, which can far exceed that of uncoated strings. Ultimately, as with many things, going with coated strings is a bit of a compromise. Though you do get more longevity (generally speaking), coated strings have less output and sustain than their uncoated counterparts. But, depending on your circumstance, this may be a fair trade-off. In short, there are two popular core shapes utilized by different companies: round core and hex core. At one time, round core was the standard shape and was utilized by all string makers. Hexagonal cores came later and were preferred for having better tuning stability, a more pronounced top end, and increased durability. These days, most string makers use hexagonal cores on their acoustic guitar strings—as do we. Exceptions to that include GHS, DR, and a few other smaller string makers. Sidenote: we do use round cores on our bass strings because the boomy low end is desirable in that usage, and string breakage is less of an issue, but for acoustic strings we believe hexagonal cores are the best option, and that’s why they’re all we use. Up until the late 1960s, almost all acoustic strings came as medium or heavy gauge sets. At first, almost all steel string guitars used steel strings (imagine that), but eventually manufacturers started utilizing 80/20 bronze, and then phosphor bronze followed in the 1970s. Access to lighter gauge acoustic guitar strings started to become widespread around the same time that lighter gauge electric guitar strings became more widely available, largely because electric guitarists started to demand similar playability from their acoustic guitars as they were getting on their electrics. As one might expect, lighter gauged strings have less tension but result in less output than heavier strings. When choosing a string gauge, the best acoustic guitar strings hinge primarily on the player and the guitar in question. Typically, we recommend Super Light (11-52) or Light (12-54) gauges for most players, with Medium (13-56) gauge working well for those that need as much projection as possible, and Extra Light (10-50) gauge working well for those that want as much flexibility as possible. As acoustic guitars rely on string vibration to drive the top for generating tone, extra light strings are the easiest acoustic strings to play but have the softest and thinnest sound. If one is using a pickup and is seeking as close to the feel of playing an electric guitar as possible, then extra light strings may be the ticket. Acoustic tone in that instance is less of a concern since the guitar will be primarily plugged in. Additionally, some parlor guitars, and many older or particularly frail vintage guitars, should be strung with extra lights to prevent further stress on the more fragile neck and bridge. Super lights are often a perfect middle ground for players who may need the lighter treble strings for bends while maintaining the heavier bass strings of a regular light set for bluegrass or alternating bass rhythm. Though lighter gauge string sets like these don’t project quite as well as a set of Mediums, per se, in studio and mic’d environments, they are often favored for how well they resonate, compared to a heavier setup. Light gauge strings are often the best acoustic guitar strings for the player that engages a variety of picking, strumming and fingerstyle approaches. They combine balanced response with versatility, including alternate tunings. Light gauge strings are standard equipment on the majority of acoustic guitars coming out of the factory with the exception of some Martin dreadnought models. 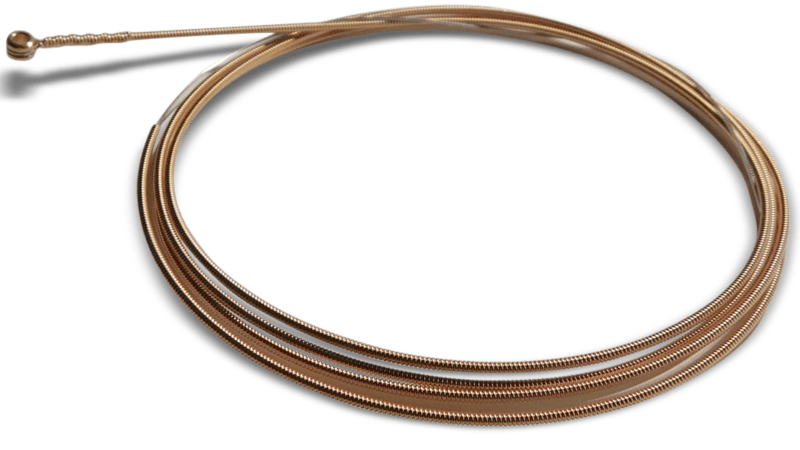 Light gauge strings are also the preferred choice of most steel string fingerstyle players. For players requiring a bigger, meatier sound and more presence when strumming or flatpicking, medium strings are often chosen. Jumbo and Dreadnought sized guitars, with their larger spruce tops, benefit from the increased string mass, but Grand Auditorium and OM sized guitars can also realize a bigger tone, although a setup to compensate for increased neck tension is advised. Additionally, Medium and heavier gauge strings are often considered the best acoustic guitar strings for players who also play bottleneck slide, as they help to avoid the fret rattle that is more common with lighter strings. Those players requiring maximum output and who have the finger strength to play them prefer heavy strings and are willing to tolerate the accelerated fret wear, nut and neck adjustments required to accommodate them. Some players like the fat tone of heavy strings and tune down to reduce tension and use a capo to get to concert pitch. How heavy can you go? Well, that depends on what your needs are and what your guitar can handle. We always recommend reaching out to an experienced tech to ensure that you don’t risk damaging your guitar with too heavy of strings. Likewise, if it’s super heavy strings you’re after, you’ll probably want to grab a custom set of strings that you can tailor perfectly to your needs. Your tone starts with your strings. Our custom options let you easily hand pick your string gauges—so you can choose the perfect strings for your guitar and your playing style. While this is a brief overview of several kinds of the best acoustic guitar strings that are available in today’s market, there are always exceptions, so be encouraged to experiment. Strings and picks are two of the least expensive ways to expand the tonal possibilities of your instrument, and ideal tone is always a subjective topic. Just because a particular style, gauge, or brand of strings is right for one player doesn’t mean they’ll be right for your guitar. Likewise, a style or gauge you would never have considered might be your tonal Holy Grail and the best acoustic guitar strings as far as your playing is concerned, so keep an open mind and open ears on your quest. Finally, if we can ever help you to better dial in a set of Stringjoy strings for your guitar, don’t hesitate to reach out any time, we’re always happy to help. Scott & The Stringjoy staff are the best! After filling out the questionnaire portion of the Stringjoy site, I was offered a custom combination of the Natural Bronze™ acoustic strings based on My wants and playing style. How kool is that, a set just for Me! I just restrung my Breedlove 6 string with them and I am so blown away at the sound, tone and especially the sustain improvement. The color was like adding a new set of jewelry to my guitar. I replaced a well know coated string set that had gone dead in a really short time, especially since that's thier thing, they last longer, they didn't. I am so happy with the extra care and attention I was given by Scott I had him design another custom set for my 12 string too. These people care and treated me like I was thier biggest and most important customer and provided an incredible product to boot. Don't wait, order yours Today. Rock On! Hi, I'm a bass player. Wish someone would produce an informative article like yours on bass strings? There is a lot of choices for bass strings and it can be very confusing too. (Maybe there is already something out there that I don't know about?) Thanks for your time. What if I want to go lighter than 10s? I thought you guys used to have 80/20 strings? What happened? Hey man! You're not wrong. All of our acoustic strings were 80/20 until a few months ago. When we developed our new Natural Bronze™ strings, we learned so much from the process that we decided to pull our 80/20 strings and redesign them from the ground up. We'll have a new line in mid-2017 and they're going to rock. thanks for the guide dudes. I just put some of the new Natural Bronze™ strings on my takamine and they sound rich and full. Keep up the good work. Thanks Jared, glad you're digging 'em! Long-time coated strings player hear, I love them. I get that they might not be 'studio quality' but I hate changing strings so they're just right for me. No worries Dan, that's all good by us. We don't make coated strings (tone is sort of our guiding focus, above all else), but they totally have a use and a purpose. Thanks for reading!